No sense in repeating what has been said so many times about this fabulous manoeuvre – tom servais took the pic and if he hasn’t made a million out of it by sticking his lawyers onto sites like this who pay nothing for using the image he should at least know that I for one appreciate the gesture. The shot itself is remarkable in that the rider looks almost stationary, as does the wave – the only signs of power and speed are in the track, Curren has done everything by bodyweight transfer alone, there is no sign of any exertion or effort in his physical demeanour – every finger is relaxed – I would like to draw a line through his centre of gravity and see what its relationship is to the angle of his board and the wave face. There has got to be a measurement of this perfection for the wave pool architects to work on – Imagine all those Japanese / Texan surfing gentlemen pouring on this type of turn (together) in one of those majestic surfing facilities. or F=GM1 M2 / R2 .. maybe Issac and kepler were into it – maybe this fellow can assist. Faultless thing isn’t it though, just beyond any comparison. Bleeding speed and allowing it to take him where his rocker was always meant to be. Pretty sure this was the forward Vee era…. whatever became of Maurice Cole? 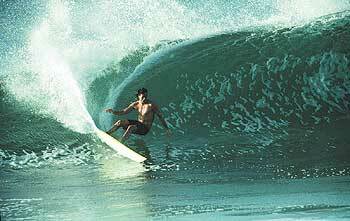 Anyway, Curren’s surfing has always been a study in “even” surfing, the beauty of unforced neutrality and the best test rider anyone could ask for. Maurice Cole? Still shaping in a shed out the back of Jan Juc Mike. Not an easy place to find as Steve Shearer will attest (went looking for him this year when we were down at Bells). Maurice’s boards still stand out by what lies underneath – these days the experiments are exceptionally deep concave on very short boards. Feedback from RC-J’s tow boards. Amazing boards they are too. Highly spec’d, F-1’s of the surfing world. And that cutback: economy of movement. Isn’t that what they said about Curren? … okay… no I don’t. It’s perfect. As it should be my good man – we do not approach these examinations with anything other than due consideration and impeccable scrutiny, our task is to examine the micro, ignore the commercial complications and pander to our readers – none of whom I would imagine could reef off a cutback anything like any of the post subjects. My fingers have been chopped off by the Yakuza Al. And drink beer in a special stubby cooler. Now that Pete was a gratuitous post and clearly in breach of your posting rules. Just making sure your not asleep at the wheel. there is video of this turn and its just as amazing as the photo , no stickers , no hair do , just perfect timing in hawaiian juice . he dosent even end up whacking it all the way round , just runs it at full tilt to the flat in front of the white water . for me the best shot of the cutty out there. have been lucky enough to see this guy surf bells a few times and what he did in the shore dump at the end of the wave i am still trying to work out as he was so fast . as you guys say the economy and faultlessness is amazing with all his surfing. as for shapers and boards , the guy could ride a fence post this well, he’s proved it time over. long live the red and black beauties. I respectfully stipulate that anyone who thinks that this cutback is faultless, or even one of Curren’s good ones, is a kook. It reeks of a failure to “drive”, as evidenced by his slightly knocked instead of slightly opened front knee, and his still-relative-high-above-the-water posture. Richard Cram might have even bought the slide and incinerated it… had it been of him.